As experienced general dentists, strive to provide our patients with high quality and convenient dental care, no matter what the condition of their teeth. In line with this commitment, they will offer oral surgery procedures when appropriate within the comfort of our Central Dental offices. Our doctors and staff encompass the professionalism and technical skill needed to provide for the complex needs of our patients. At Central Dental, we enjoy being with our patients every step of the way, which is one of the many reasons why our doctors perform oral surgery our patients. Rather than referring you to new physicians who aren’t familiar with your particular condition, we create a personalized experience that allows you to feel safe and comfortable. We understand that the thought of having to undergo oral surgery can be quite unnerving, and do everything we can to ease your anxiety. Extraction of Wisdom Teeth – Wisdom teeth can often negatively impact the alignment of other teeth and make achieving proper oral hygiene difficult resulting in infection, decay, and a great deal of discomfort. It is beneficial to remove the wisdom teeth through oral surgery when this occurs. By carefully monitoring the progression of your oral health, your doctor is able to determine whether or not the wisdom teeth need to be extracted, and if so, the optimal time for removal. Oral surgery to remove wisdom teeth is a very common and safe procedure. You can feel confident in knowing our doctors are very familiar with this type of procedure. Other Extractions – At times a tooth needs to be removed due to severe gum disease, irreversible damage to the nerve inside the tooth (and the patient opts not to save the tooth), a failed root canal or endodontic treatment, fracture, or decay. Our doctors at Central Dental are highly trained and skilled in extraction techniques. Placement of Dental Implants – In an effort to provide the most comprehensive and convenient care to all of our patients, your Central Dental dentist may offer to place your implants rather than refer you to an outside oral surgeon. Your doctor is involved in every stage of the treatment when you are receiving dental implants allowing for safe and accurate care. You can feel comfortable every step of the way during your dental implant placement. Bone Graft Procedures – When bone has deteriorated due to infection or become damaged due to trauma, a bone-grafting surgery may be necessary to further support the structure of the mouth. Bone from natural or synthetic sources may be used. This procedure uses healthy bone to rebuild areas of the jaw and dental ridge that have been weakened. Bone grafting is most frequently performed for patients pursuing dental implant procedures or those seeking a more comfortable fit for their dentures. Ridge Augmentation – Ridge augmentation is a common procedure performed after tooth loss. If the ridge where the natural teeth once were has receded following tooth loss, this can create an unnatural look and cause the gums to detract as well. The addition of bone to the affected area can reverse the effects of deterioration and create an aesthetically pleasing restoration, as well as provide adequate support an implant. Treatment of Infection – Occasionally an infection may become so severe that it must be drained to facilitate healing. Frenectomy or Frenulectomy – The removal or alteration of a frenulum. A frenulum is a fold of tissue or muscle that connects the lip and cheek to the gums, the tongue to the floor of the mouth, or the gingival tissue between two teeth. The removal of a frenulum allows for the closure of space between teeth, freeing movement of the tongue out of the throat, a more comfortable fit for denture wearers and improves speech and swallowing patterns for those who may be tongue tied. At Central Dental we typically use a laser for this type of procedure and most patients liken the discomfort to the burning their tongue with a hot slice of pizza. Gingivectomy – If you have a “gummy” smile this just may be the procedure for you. Your doctor will carefully remove excess tissue or correct asymmetries to enhance your smile. 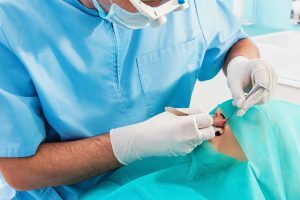 Biopsy – Occasionally our hygienists and doctors may detect an area of tissue that may be cancerous. This requires a biopsy be sent to a pathologist for further evaluation. These procedures are relatively pain free. If you’re in need of Oral Surgery in Little Rock, Conway, or Central Arkansas, Central Dental can provide you with a consultation to determine if a procedure within our office would be the best fit for you. Our dental team is looking forward to helping you achieve and maintain dental wellness.